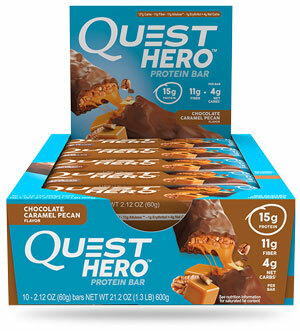 Quest Nutrition Hero Bar is your healthy answer to a candy bar! The Hero Bar tastes like a candy bar with a tasty protein-filled coating and a soft filling and chewy core, but leaves out the unwanted fat, calories and sugar. Each Hero bar provides 15 to 17 grams of protein (milk isolate, whey isolate), depending on flavor, with 11 grams of fiber and 30 grams of carbs (4 grams of “net” carbs). 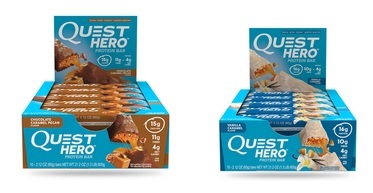 Quest uses the sweetener Allulose in the Hero bar. Allulose is a low calorie sugar with the same clean, sweet taste you expect from sugar, but without the calories. You can eat as many of these bars as you want and stay lean, get yours today! Enjoy one Quest Protein bar as a meal replacement or anytime you just want a little snack. INGREDIENTS: Protein Blend (Milk Protein Isolate, Whey Protein Isolate), Soluble Corn Fiber (Prebiotic Fiber), Allulose‡, Palm Kernel Oil, Erythritol, Water, Butter, Almonds, Natural Flavors. Contains less than 2% of the following: Sea Salt, Baking Soda, Palm Oil, Cellulose Gum, Xanthan Gum, Carrageenan, Sucralose, Sunflower Lecithin. Allergens: CONTAINS: Almonds and Milk-Derived Ingredients. INGREDIENTS: Protein Blend (Milk Protein Isolate, Whey Protein Isolate), Soluble Corn Fiber (Prebiotic Fiber), Allulose‡, Palm Kernel Oil, Pecans, Cocoa, Butter, Water, Erythritol, Natural Flavors. Contains less than 2% of the following: Sea Salt, Baking Soda, Palm Oil, Cellulose Gum, Xanthan Gum, Carrageenan, Sucralose, Sunflower Lecithin. ‡Allulose is a low calorie monosaccharide that contributes 0.4 calories per gram. Allergens: Contains: Pecans and Milk-Derived Ingredients.